The Scot had shared the first round lead but a second round 74 saw him slip back and his chances looked doomed when he made a quadruple bogey eight on the seventh hole on Sunday. The lead kept moving backwards on a windy day at DLF Golf and Country Club, but as he stood on the 15th tee, Gallacher still looked an outside bet facing one of the toughest closing stretches on the Race to Dubai because of that snowman on the seventh. The 2014 Ryder Cup star knows a thing or two about performing under pressure, however. 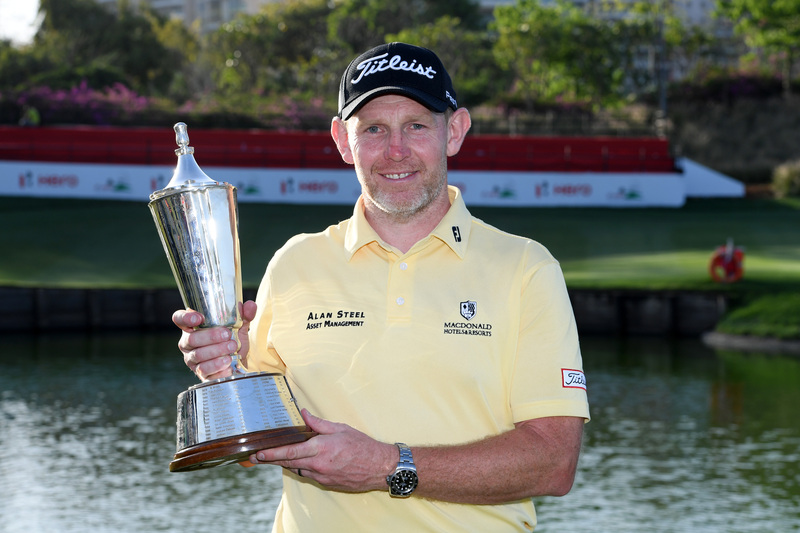 And he took advantage of the par five before hitting stunning approaches into the 17th and last to claim his first win since the second of back to back Omega Dubai Desert Classic titles in 2014. On Mother’s Day back in his native Scotland, it was a father and son show in New Delhi, with son Jack caddying for Gallacher this season in what is likely to be a permanent move for the duo. A closing 71 moved the 44-year-old to nine-under and gave him a one-shot win over Japan’s Masahiro Kawamura, with Spaniard Jorge Campillo a further shot back. A delighted Gallacher said: “Today the wind was swirling and the course was playing really tough. “I was three behind the lead at the start of the day and got off to quite a solid start and then I hit a quadruple-bogey on hole seven. I was pretty calm at that point of time, I stood on the eighth tee and saw I was only five shots behind. “I told myself to stick to the game and you never know what can happen. Especially with how hard it was playing and I came back three-under in the last four holes. “I thought, ‘just hang in there’. When I birdied 15 I saw that Julian Suri had come back and then when I got to the 16th green I was tied for the lead. I just tried to finish as strong as I could, and I did that. “Thankfully it was enough. I am 45 this year so I am really proud of what I did out here today. It changes my schedule and I can play a bit less and it was great to win with my son Jack on the bag. Masahiro Kawamura, who has one win to his name on the Asian Tour back in 2013, admitted feeling nervous coming down the stretch. He said: “The round was very good especially in such tough conditions. “I wasn’t playing very well in the front nine and was struggling on a lot of the holes and I had some missed shots, but the back nine I played very well. “The course was tough today, but I managed to come back. “Coming into the last two holes and seeing my name on the leaderboad, I was really nervous,” said the Asian Tour winner, who claimed the 11th card at the European Tour School, in November, at Spain’s Lumine GC. Kawamura added: “I knew how important the final hole was and I hit a good shot but was just unlucky. American Julian Suri had led by three after 12 holes but produced a quadruple bogey of his own on the treacherous 14th to slip back, and he finished alongside South African Christiaan Bezuidenhout at six-under. Bezuidenhout made six birdies and two bogeys in a 68 that handed him a third top 10 in four events and he finished three shots off the lead, one ahead of fellow South Africans George Coetzee and Erik van Rooyen, Spaniard Nacho Elvira and Hertfordshire’s Callum Shinkwin.